A file photo of an NTPC initiative under CSR. The last financial year saw an overall increase in fund allocation for corporate social responsibility (CSR) activities and focused expansion of CSR projects. In the previous year, when CSR Rules came into force, the 100 top firms listed on National Stock Exchange (NSE) spent a total of ₹ 4,760 crore on CSR activities. The figure rose to ₹ 6,033 crore in year two, as per data sourced from the annual reports of the top 91 NSE-listed companies by market capitalization and analysed by NextGen Pvt. Ltd, a CSR management firm. 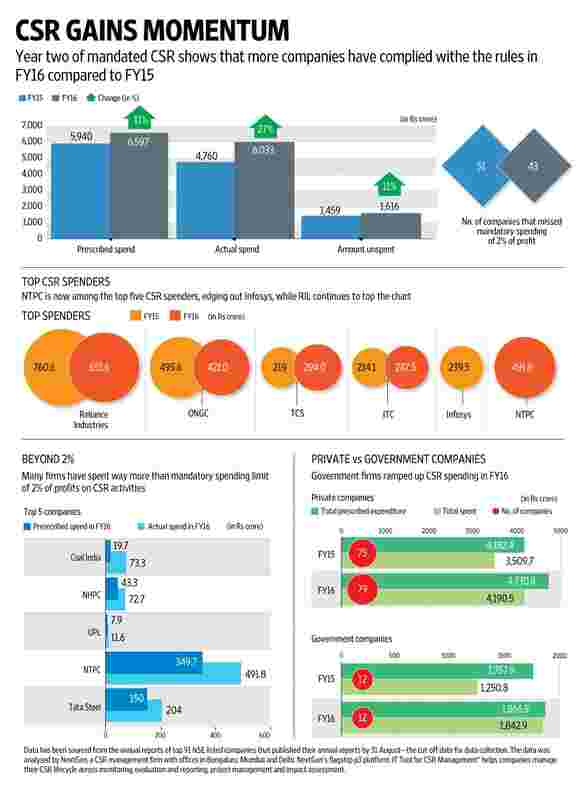 The spending by these 91 companies—those that had published their annual reports by 31 August, the cut-off date for data collection—was compared with their spending in the previous year. The latter set may not necessarily have been among the top 91 in financial year 2015. The remaining nine companies among the top 100 have either not released their annual reports or follow a different financial year. Twenty-six of the 91 firms showed that their total CSR spending had exceeded 2% of their profits. The number stood at 21 in FY15. CSR Rules, which came into effect on 1 April 2014, state that companies with a net worth of Rs500 crore or revenue of Rs1,000 crore or net profit of Rs5 crore should spend 2% of their average profit in the last three years on social development-related activities such as sanitation, education, health-care and poverty alleviation, among others, which are listed in Schedule VII of the Rules. “No company wants to be seen as unwilling to spend on social issues," said Vijay Ganapathy, a partner at Thinkthrough Consulting, a social sector consultancy. Ganapathy added that the CSR legislation and its reporting mandate had led to a kind of “negative reinforcement" that will continue to increase corporate spending on social development. The top spenders more or less remained the same. Reliance Industries Ltd (RIL), which was the highest spender in FY15 at Rs760.6 crore, remained on top with an allocation of Rs651.6 crore to CSR in FY16. Similarly Oil and Natural Gas Corp. Ltd (ONGC) was the among the top five spenders in FY15 at Rs495.2 crore and was among the top five in FY16 at Rs421 crore. A number of firms that failed to meet the 2% target in FY15 surpassed that in FY16. Coal India Ltd (CIL), which was required to spend only Rs19.7 crore in 2015-16, spent Rs73.3 crore instead. Similarly, India’s largest power producer NTPC Ltd missed the 2% target in FY15, when it spent Rs193.05 crore instead of the Rs271.35 crore it was required to allocate to social development activities. In FY16, NTPC spent Rs491.8 crore, which was 3.62% of its profit. The higher CSR spending should be credited to the involvement of board of directors of the companies, said Adarsh Kataruka, director at SoulAce, a CSR consulting firm. “For a majority of the firms, FY16 can be said to have been the first full year of CSR Rules being in place. Prior to that there was uncertainty and lack of clarity on the law, with back and forth between the government agencies and industry associations till mid- to late-2014 on the exact implication and implementation of the legislation," Kataruka said. The increase in CSR spending from FY15 to FY16 was most evident among public sector undertakings (PSUs) . Twelve PSUs put together spent Rs1,250.8 crore in FY15, which went up to Rs1,842.9 crore in FY16. While 75 private incorporated entities spent Rs3,509.7 crore in FY15, 79 such firms spent Rs4,190.5 crore in FY16. For most PSUs, the schemes and projects pushed by the union government and ministries become a priority. A senior NTPC official in the company’s CSR department explained on condition of anonymity, “As such the deciding/influencing factors in selecting CSR projects remained the same in both the years. However, in 2014-15 and 2015-16, the national agenda of Swachh Bharat and Swachh Vidyalaya Abhiyan was given prime importance." Apart from the increase in overall CSR spending by companies, the trends did not change dramatically. As Ganapathy pointed out, education, health, sanitation and rural development remained key focus areas of CSR initiatives. CSR spending of the firms on education and skill development was Rs1,703.9 crore in FY16—an 11% jump from Rs1,532.2 crore in 2014-15, according to data analysed by NextGen. Pearl Tiwari, president (CSR and Sustainability) at Ambuja Cement Ltd, said the last two years have been about restructuring ongoing CSR projects to align with activities listed under Schedule VII. “While the thrust and locations of our CSR activities have remained the same, the focus has been sharpened and reach of projects expanded," she added. Ambuja Cement spent Rs40.98 crore in FY16, up from Rs38.4 crore in FY15, via its philanthropic arm Ambuja Cement Foundation. Similarly, Sheetal Mehta, who heads the CSR division at Mahindra and Mahindra Ltd, said: “We have implemented a few new projects in FY16 like road safety programme and some innovative scholarships for needy and deserving students. But largely in accordance with the company’s CSR vision, we have continued to focus its CSR projects in the constituencies of girls, youth and farmers by programmes designed in the domains of education, health and environment." The Godrej Group more than doubled the number of CSR projects from seven in 2014-15 to 15 in 2015-16. The number of its on-the-ground partners went up from 20 to 30 in the same time frame, said Vikas Goswami, head of the CSR and sustainability initiative of the group. “CSR focus continues to be on two main areas, namely employability training and environmental projects," she said, adding that in 2015-16, Godrej Industries Ltd’s CSR project portfolio expanded to include health and higher education. Godrej Consumer Products Ltd spent a total of Rs14.57 crore on CSR activities in FY16. Companies face the same challenges they did in implementing CSR in year one. “Finding the right implementing agencies is a big challenge in CSR," said Sudhir Singh, a partner at consulting firm PwC India. He said that it will take another year or two for grassroots partners to reach the professionalism needed to absorb excess capital in the social sector made available because of the CSR law.